The monument in the German capital’s Tiergarten Park is a burnished concrete block with a perforation in the centre. A screen has been placed inside. 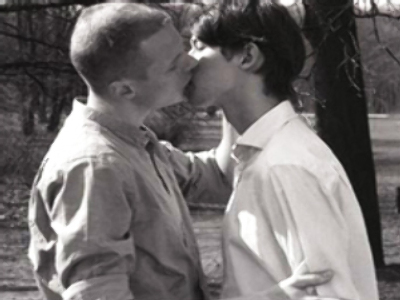 It shows a short film of two men kissing. The footage is expected to be changed every two years. The monument was designed by two European artists, Michael Almgreen of Denmark and Ingar Dragset from Norway. It cost the city 600,000 euros to build. One of the main supporters of the project was Berlin’s well-known gay mayor, Klaus Wowereit. In Nazi Germany, homosexuality was considered deviant behaviour, which threatened the purity of the nation. Fifty thousand gays were declared criminals and sent to concentration camps. The historians say that from 10,000 to 15,000 of them died there.